Head boy Ariyan attributed his achievement to his parents and teachers because they were his biggest role models. Newly-inducted Andrews Primary School head prefects Ariyan Deo and Alisimere Saukuru are optimistic that firm leadership will allow better control of students. School prefects inducted yesterday will work closely with teachers to ensure students are disciplined and follow school rules. He said his parents were so proud and happy that he became the head boy. “It will now be a challenge to balance my school work and play the role of head boy, but I am ready for that and I will put my best foot forward,” Aryan said. “A leader is one who knows the way, leads the way and shows the way correctly,” Is Ariyan’s definition of a leader. Head girl Alisimere aspires to become a pilot one day. She feels proud and honoured to be selected as the head girl of the school. “I hope to do my best to please my teachers who have faith in my leadership qualities. They have trusted on me and I will do my duties to the best of my ability to serve the school and students,” Alisimere said. 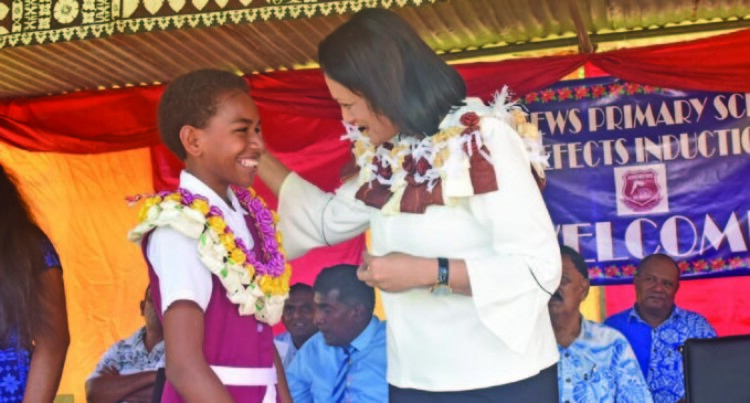 During the Andrews Primary School’s prefect induction yesterday, the Minister of Education, Heritage and Arts, Rosy Akbar said leaders were those who could make tough decisions. Ms Akbar highlighted what it took to be a great leader and reminded prefects that they had an important role in representing the views of the student body in relation to decision making and that they had a challenge to lead by example.